Your favorite fettuccine Alfredo recipe without that extra calories. Easy, delicious and your kids will love it too. 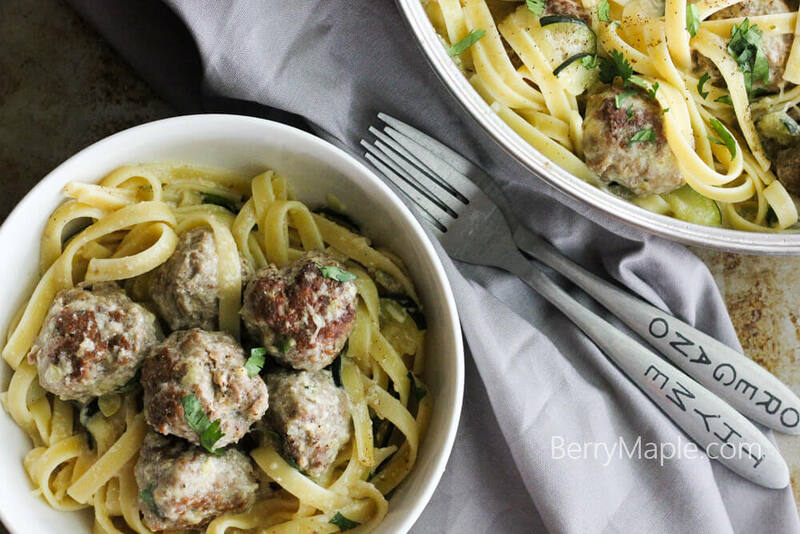 What will happen when you decide to combine delicious meatballs and fettuccine Alfredo ? A great family dinner! What makes it skinny? I substitute cream with just regular milk and add a bit less cheese to the dish. Easy! Combine all the meatball ingredients in a medium bowl. To the same pan add minced garlic and butter and let it cook for a minute. Add in the flour and cook, stirring ,for 1 minute. Whisk in the milk and cook, whisking constantly, until just thickened, for couple minutes. Add meatballs back in to the pan an cook on low for about 7 minutes. Add cooked fettuccine and stir carefully. Divide among bowls and top with parmesan, chopped cilantro and pepper. Brilliant idea. They look so delicious ! This looks like such a delicious meal and so easy too! A great way to enjoy one of my favorite pasta dishes! Comfort food at it’s best! I bet my kids would love this dish. 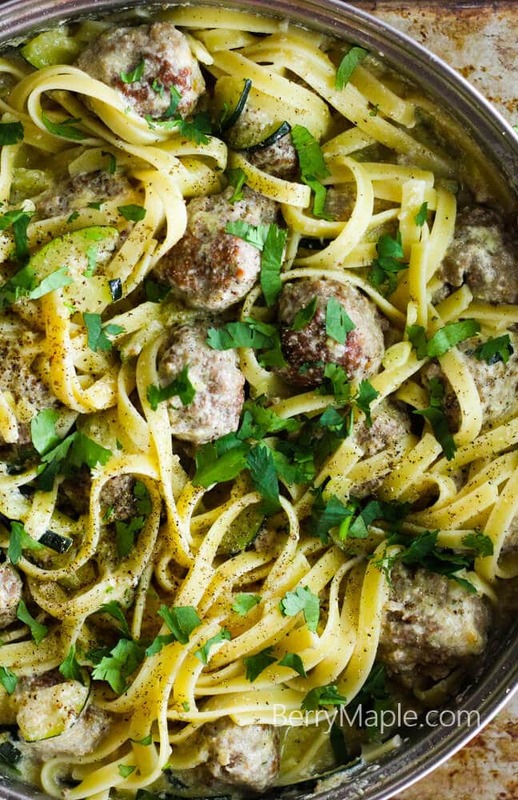 Pasta and meatballs, doesn’t get much more comforting than that! This looks so beautiful. I need this comfort food for the cold spring out here! Love it! I love how you’ve lightened this up! 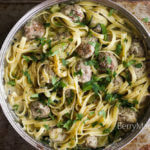 It looks so creamy and I bet it’s perfect with those yummy meatballs! Can’t wait to try it! Yum! I love meatballs on veggies and pasta! The beef and parmesan — sounds SO comforting and delicious! This is comfort food dreams! Need to make this for my husband so he has food for when I am out of town. creamy noodles were always a comfort food growing up. I like your skinny version!! This sounds so yummy! 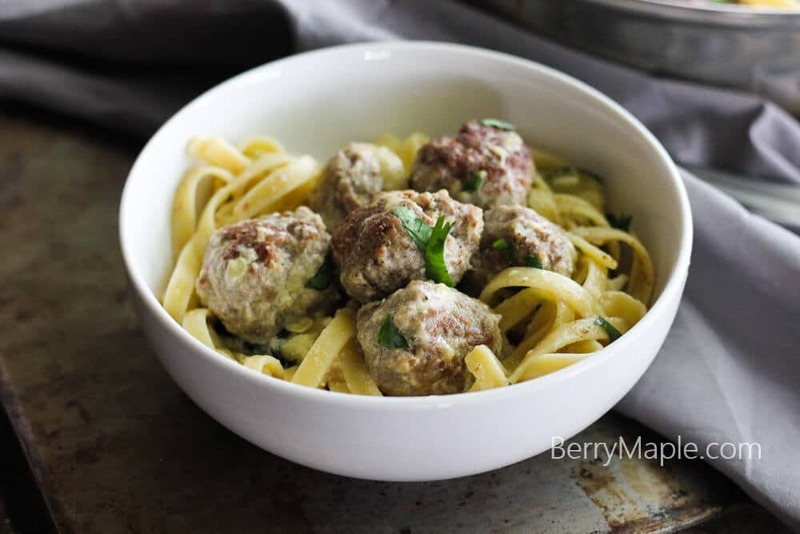 I love fettuccine alfredo – I bet the addition of meatballs makes it really hearty and perfectly filling. Such a fun meal! So fun! Looks just like you would get at a restaurant! Looks so yummy and creamy! Such a perfect meal for a date night.